Sean wasn’t keen on calling it When Rainbows Vomit… so Technicolor Yawn was his replacement suggestion. Means the same thing but much more… ahem… tasteful? Maybe we should have gone with The Robert Kaufman Kona Color Card: Quilt Version. That’s basically what it is. The unquilted, but full picture version is here. Sean tried to nix the throw pillows. I won. While it might be a bit bright for some, I love it. And it’s more than perfect for our usually dark bedroom (the back of the house is much, much, much brighter). 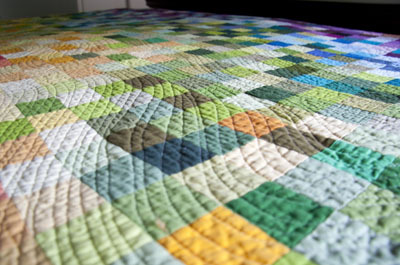 Angela Walters quilted Megapixel. It’s curves are simply dreamy. Since I freeze every night during winter (winter being defined as September through June) I had to make an extra little something for my side of the bed. While it isn’t a pattern in Scrap Republic, it’s built on many of the same principles. I’m working on some more rainbow loveliness now. Pictures … soon. Disclaimer: I hate the wall color in our room. Please ignore it’s hideousness. Very, very cool! Funny, in our neck of the woods quilts are for summer, duvets are for winter. wow! This is fantastic. And the quilting by Angela, super. Very pretty and impressive! 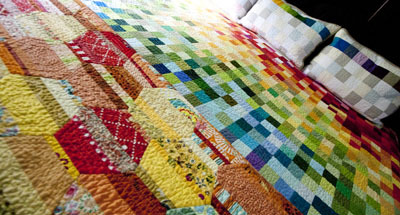 Love the movement in the piecing and the quilting. Wow. 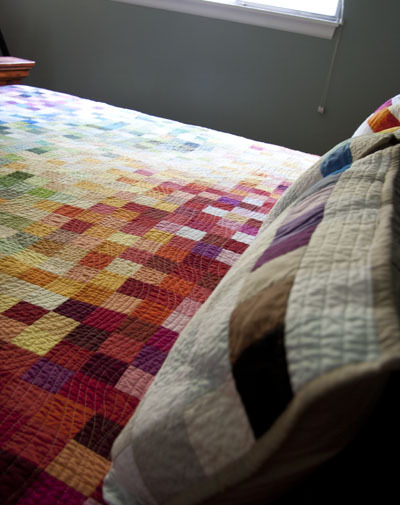 I had no idea I loved rainbow quilts so much. Until now! LOVE both the bed quilt and the extra throw quilt. I too am always cold, sometimes even in the summer. You really know how to use color and bold prints. This is amazing..really love the pillows!! 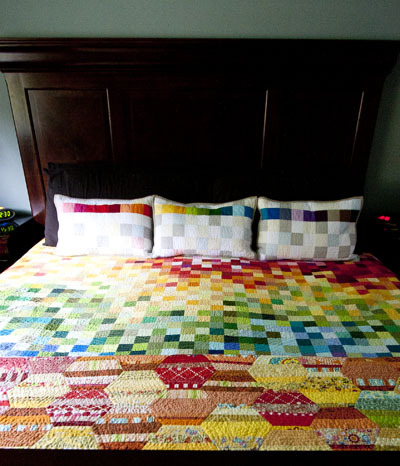 The winters are definitely L-O-N-N-G. Now there is fabulous color on your bed! Love this!! 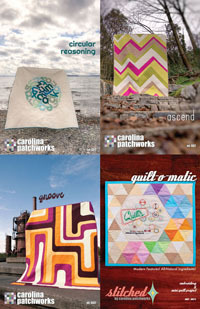 I don’t suppose you would consider making a pattern for those of us who can’t do anything without one, would you? As always, your work is inspiring. These are both just beautiful. 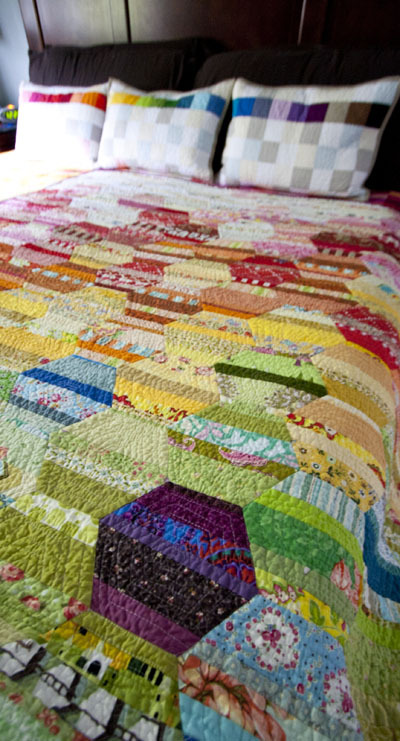 The quilting on Technicolor Yawn is just perfect too. I love it!!!!! It makes me want to trash my almost clean sewing room and go at it! Absolutely Love them both!! Just found your website the other day, and have been back repeatedly to look again!! 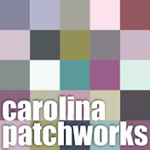 so Many of your patterns that I want to do. 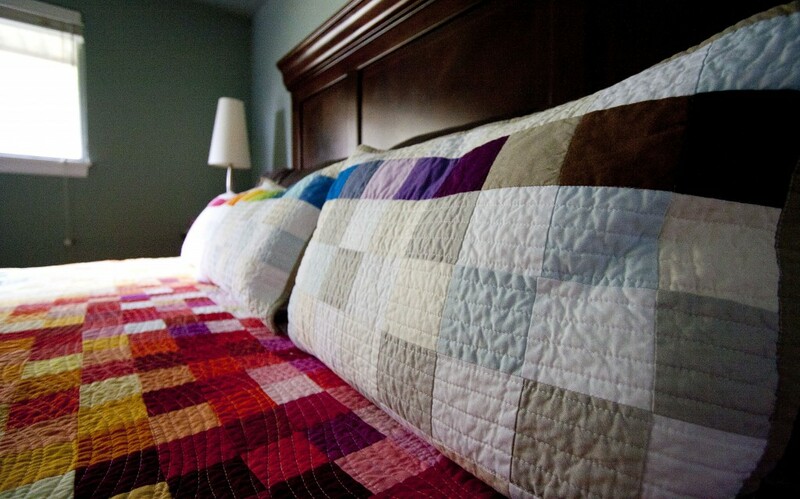 WOW, does not begin to describe how I feel about this beautiful quilt you have done. I have a passion for octagons and now have a new way to use up some scraps and a couple of fabric rolls. I have never been one for bright rainbow colors but your quilt just may have giving me a new way to look at colors when picking out fabrics. I usually gravitate to greens,blues and purples more in the jewel tones. I will definitely be following your blog now for some inspiration.